If you decide it is a time for your bathroom remodeling, there are a few options you might consider to make it happened. First choice is the easiest, but in real life we see that more and more homeowners trying to do remodeling projects by themselves and it is a simple explanation to this – everyone want to save. It is definitely not an option for custom bathroom remodeling where is the quality and appearance ahead of money, but it will work for people whose priority is to save and willing to spend their vacation time working on the house improvement project rather than go somewhere for a few weeks. Even though bathroom remodeling is not an easy work it can be done well with a right approach. You definitely don’t need to read any articles or watch how to videos if the remodeling project will go as far as painting the walls and changing light fixture, but if you are considering doing a complete remodeling it might be helpful. If you are asking yourself how to remodel a bathroom – there are a few steps that need to be performed. You have to be creative and design you bathroom the way you will like it and at the same time it will serve your needs properly and practically. If you choose to be your own designer, think where and how you want to place every single element of your bathroom from the shower and bathtub to the color of the walls. Ones it is done, you are ready to start the work. Learn what to consider before starting on bathroom remodeling. It might seems very easy and looks like for half day couple of people with a hammer and bars can take out everything what is possible from the bathroom. But be aware there are water pipes goes in the walls and ones you will brake some it might not be a savings any more. For this matter, first of all, locate the main water valve to your house and make sure you can get there and shut the water in a case of an emergency. Also check which fuses on electric box disconnect the power from the bathroom you are planning to work on. Start demolishing from disconnecting everything from the water and power lines. Take out faucet(s), toilet, light fixtures, and then start on a bathtub, shower and cabinets. Other step is to take out tile from the walls and a floor. In some cases it is better just remove a tile with a backer boards and then install a new ones. Also it is a time to open walls for all necessary plumbing and electrical work. On a bigger scale bathroom remodeling project perform all the necessary framing work. This is something you do not want to mess up with. For this mater it is always better to hire licensed contractor to make sure electricity and plumbing will be done right and according to local codes. On this stage you have to have a shower or (and) bathtub faucets, bathtub, which will be installed, recess lights and bathroom fan. It is also a time to remove water lines and drain pipes if necessary. When all drains and pipes done install or build shower pan. Install insulation and hung drywall. In the places where will be tile install backer boards. Patch, sand and prime walls. If heated floor is desirable and it is a part of your bath remodeling project – install floor headed system. Install, grout and seal if necessary tile. Depend on design and preferences it is possible to install tile all over bathroom walls, or just in the shower and around bathtub. And for the floor tile is definitely the best option. Take into consideration that ceramic tile is easy to install, but if you will go with a stone tile, such as granite or marble it might take longer to install. It is one if not easiest part of whole remodeling project. Just pick desire color and suitable for bathroom finish of paint from local retailer and in a few hours your bathroom will have a different appearance. You have to plan from the begging what you bathroom will look like and already have all the fixtures have to be installed. Ones the vanity will be in place you can choose a vanity top. Hang the wall cabinets; install toilet, light fixture and faucets. If you bathroom is a standard install shower door which you can buy from any home improvement store. If it seems like you can manage to perform the work in a couple weeks than you should definitely start on your bath remodeling by yourself, but if you feel like it will be undoable for you then you should consider hiring a contractor to perform the work. Another thing is for bathroom remodeling it is necessary to have proper tools. If you do not have it in your possession it is an option to rent, but it is an additional spendings. 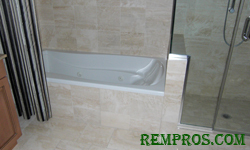 Check cost of bathroom remodeling if you will plan to hire a contractor.